After them there is Instability, another piece of perfection that saves the day. After years listening to this album, which I discovered through a Psy-Trance composer friend of mine, I've came to the conclusion that it is undoubtly one of the finest piece of music production I have in my CD/MP3 collection (10 000's of CDs and 100 000's MP3). I am an electro and minimal DJ who spent a large time listening indy rock, punk rock and new wave while younger. I have been through many musical movements throughout my life, both in man and machine produced sounds. I always tend come back to this album as it is always such an immense pleasure to play it, especially on a high quality sound system. Songs are so rich, deep and superbly produced that I cannot get bored with it. The progression of the track listing is also a wonderful thing, intensity going crescendo. Last tracks are just an explosion of genius. They get me almost crying every time... Thanks guys this is a marvel!! Hope to hear more from you in the near future with a new album. This is my favorite album of all time till these days! Yaniv Shulman surprised many people when he released his debut album Soundscapes And Modern Tales on Shaffel Records early 2002, with great quality psychedelic chill. Here he is back with his second album on his own label Aleph Zero Records. In this album he has also been collaborating with Omri Harpaz. 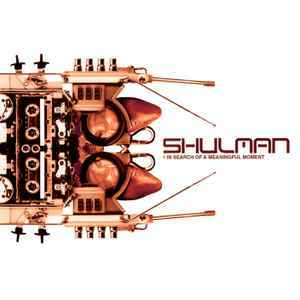 Shulman is already well known for fantastic sound quality in his music, and this is no exception. In his first album some people said it was some kind of clone of Shpongle. In my opinion it was for sure inspired by Shpongle, but he did it in his own unique way. This time he has gone his own directions and come up with something total unique and fresh. The first track is a really slow track, almost without beats. Very floating psychedelic sounds. It varies all the way and never become boring. Track 2 is my absolute favourite on this album. Definitely one of the absolutely best chill out tracks released 2003! Ok, you get for sure that Shpongle feeling, with bubbling sounds and relaxed rhythms. Then we get some incredibly nice flute, together with floating beautiful sounds. Relaxed melodies coming and going, with a lot of variation all the way. We also get a part of really nice guitar play. Fantastic track! Track 3 sounds a bit darker. We get some tribal female vocals and beautiful atmospheric sounds. Just totally chilled all the way. Track 4 is one of the more experimental tracks on this album. Mostly just floating in beautiful sounds. Those sounds we get in there are really psychedelic and pretty weird! We also get some tribal vocals. Track 5 is a really relaxing ambient track, with some Indian flute, beautiful weird sounds, and relaxing rhythms. Track 6 is also really psychedelic and experimental. Shulman sure has gone his own directions here. Great variation of sounds and atmospheres. Track 7 is a short little track, which is the most slow going track on this album. Just beautiful floating sounds. The last track on this album is my other favourite track on this album. This is also definitely one of the best chill out tracks released in my opinion! The floating sounds and melodies in this one are so beautiful! This track reminds me of the style on his first album. Very psychedelic and relaxing, with an ethnic touch and a ton of nice variation. This album is definitely among the best albums I have ever heard. I also think Shulman has become even better since his first album. Shpongle, Entheogenic and Shulman are for sure in another league than most other artists when it comes to psychedelic chill out these days. Recommended! The second Shulman album starts off a bit better than the first, these guy have evolved a bit. The only bad thing here is that the songs are just too long and they lack content as well most of the sounds they use don't have any intrest, I mean they try to create some beautiful melodies, but somehow fail in that as well. Not just my cup of tea. It's absolutely delightful to see Shulman play with everyday sounds and create an imaginary scenario that will take you on a journey to another world. Just turn off the lights, forget the TV and the computer, close the windows and listen to this album with max volume. Spend some time in a different world created by Shulman. You'll be amazed with the effect this album will have on you, trust me! Coming out as the replacement for Shpongle and, in my humble opinion, the best Ambient/Chillout producer so far.